It looks like something out of a 1950s B-movie: Carpenter ants crawl along the lip of a strange jug-shaped red-and-yellow plant. Then, whoosh! An ant slides off the plant’s slippery edge and falls into its gaping maw, to be digested by enzymes in a syrupy goo. “There’s nothing he can do. Too bad!” remarks an obviously delighted Tak-Sing Wong as he watches the scene unfold on the giant screen behind him. Eventually, he stops the video, turns back to his rapt audience, and continues to tell the story of how the carnivorous pitcher plant inspired him to develop a completely repellent synthetic coating. This coating is called SLIPS — Slippery Liquid-Infused Porous Surface. Wong refers to it as “a slick solution to a broad range of sticky problems.” SLIPS can slow blood coagulation during surgery, prevent bacterial growth and could even help tackle the global water scarcity problem. To hear that talk, over a hundred people crammed themselves into the Hayden Planetarium. Some sat in folding chairs, many others were standing, sitting cross-legged on the floor by the stage, or leaning on the railing around the giant meteorite that towered over the crowd. 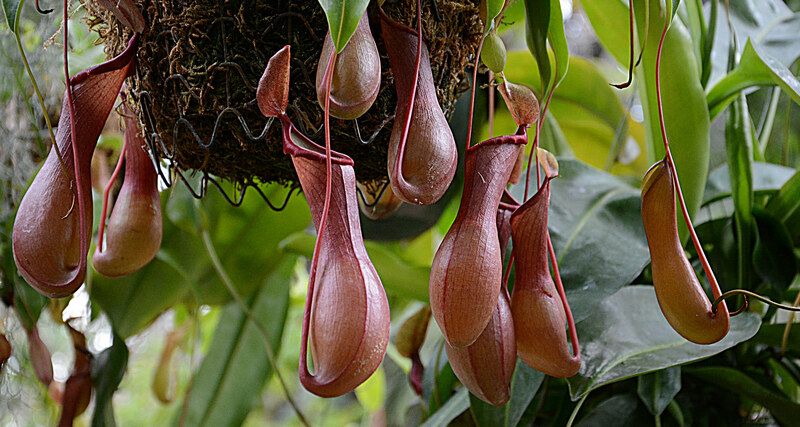 “Why is the pitcher plant so slippery?” Wong asked the group. He explained that it’s because the plant is covered by a thin layer of water, with tiny water particles trapped in the spongy surface of the plant. His lab was able to take this concept and create a synthetic material that similarly traps liquid, creating a completely repellent, slippery surface. From humpback whales to gecko feet to pitcher plants, inspiration can be found anywhere, agrees Frank Fish, a biologist at West Chester University in Pennsylvania. “Nature is an incredible resource, and we can harvest from that resource. Exploit what we learn from plants and animals, as well as cells and microbes,” Fish says. The trend now, Fish says, is the move from the micro to the macro — from shark skin to cellulose. “These large morphological things that you can actually see have sort of been, what you might call, the low hanging fruit” in the field of bio-inspiration, according to Fish, who studies locomotion in marine mammals. And Wong’s newest research certainly goes microscopic, taking cues from the unique structure of cells. His lab has created a self-healing liquid film inspired by the process of phagocytosis, when a cell opens its membrane to selectively engulf large particles. Wong’s synthetic membrane acts as a reverse filter, letting large materials pass through and leaving smaller materials behind, resealing after the object passes through. This can be used to sterilize things like surgery or toilets, where the larger objects — surgical tools, feces — can penetrate the membrane, while bacteria or germs are unable to pass through. Fish admires that Wong was able to develop a filtration material that doesn’t exist in our macroscopic world. He hopes this microscopic focus will become a new trend for the field of biomimetics as a whole. “They’re taking it down to the level of a cell, and that becomes more and more interesting as people learn more about living entities,” Fish says. At least 8.7 million species have been identified on Earth — and many researchers believe there are millions more still undiscovered, most of them microbes. There’s a lot we can learn from these species, Wong said as he wrapped up his talk at the museum. Questions after the talk were largely about the many potential applications for these materials: Can SLIPS be used on boats? Yes. Can it be used in human arteries? Not yet. Can the membrane be used to sterilize surgeries that go for longer than a few hours? Yes. Most of these nature-inspired materials are not vastly distributed but are slowly starting to see greater commercial use as coatings on Navy boats or in antibacterial hospital equipment.